A fast 3-D optical microscope which can acquire a full field image of the surfaces of objects at nanoscale resolution was developed recently in the lab of Prof. Ibrahim Abdulhalim (pictured right) in the Unit of Electro-Optical Engineering at BGU. The microscope is based on parallel phase shift interferometry, which allows for three phase images to be obtained simultaneously and extraction of the height topography map in a simple algebraic computation. Based on the same principle, the researchers demonstrated vibration measurements with amplitudes ranging from 1nm to tens of microns with sub-nm resolution. The microscope emerged from the doctoral and post doctoral work of Dr. Avner Safrani followed by Dr. Michael Ney's post-doctoral work. Results of the research were recently published in some leading optics journals such as Optics Letters of the Optical Society of America, and were among the top downloaded papers during the publication month. Based on the interference phenomenon of light waves, it is possible in principle to measure displacements with precision less than the radius of an atom. A good example of this was the historic event in February 2016 when researchers succeeded, using the LIGO interferometer, to measure gravitational waves originating from far away objects in space for the first time. The Nobel Prize in Physics was just awarded to three researchers who played a key role in LIGO's development. 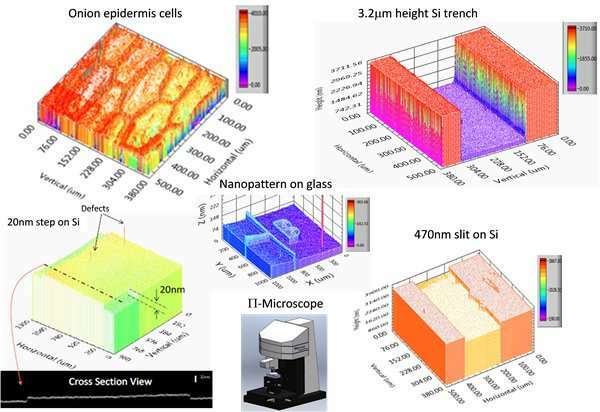 The research was supported by the Kamin program of the Ministry of Economy and by the industrial consortium Metro450, which was established for the purpose of developing high speed optical metrology equipment with nano-precision for inspecting the fabrication processes in the nanoelectronics industry, when the Si wafer size becomes 450mm. Prof. Abdulhalim said: "In response to the request from the optical metrology companies, we arrived at a speed faster by two orders of magnitude than what they asked for, and with sub-nm precision. The next step in the research, which will be the research topic of two PhD students Amir Aizen and Andrey Nazarov, is to build the microscope and the vibrometer compactly and to develop biological applications that will allow imaging of cell profiles quickly with nano-precision without the need for fluorescent staining. The high speed and precision will help biologists to follow dynamic processes in short time scales, while determining cell profile with nano-precision will help in diagnosing diseases such as cancer at early stages."